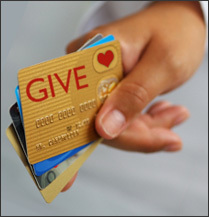 Home » General » What Are Charity Credit Cards? If you would dearly like to give to charity but haven’t got the funds to do so, a charity credit card could help you to assist the cause of your choice without breaking the bank. Charity credit cards work in a very similar way to cashback credit cards, so every time you make a purchase you earn money or other treats and rewards such as points. While with a cashback credit card these rewards will go into your account, a charity credit card allows you to donate the “earnings” to your favourite charity. The beauty of this sort of scheme is that it means you are able to make a difference to whatever worthy cause you choose every time you pay with your card. It allows you to tap into the feel-good factor while you are shopping and not just because you’ve found a sensational new pair of shoes. How Much Will the Charity Get Paid? The amount that the charity will be paid with each credit-card transaction depends largely upon your provider and the amount of spending you do on your card. If you look at each amount individually, you might think the cash paid to charity seems insignificant. However, if lots of people are donating their rewards with every purchase they make, the combined amount of cash is quite sizeable. It is certainly enough to make a difference. If you are looking at a charity credit card, make sure you are as aware of the pros and cons before you start spending. Just because it is a charity credit card doesn’t mean the bank won’t be making substantial profits from its use. You are not the charity in this situation. Make sure you are not being charged huge fees or interest rates on your charity credit card, especially if the amount you are charged adds up to more than what you will make for the charity. In this situation it might make more sense to get a credit card at a cheaper interest rate and simply donate the cash you’ll save. Before making your choice, check out your options by using an independent online comparison site. You can analyse many different credit cards. Charity credit cards work for some people but not for others. Take care to look carefully at your own personal circumstances before you make a decision. Written by Andrew Griffiths. Andrew has worked in financial services for 10 years and enjoys writing about credit cards, debt, loans and all things money!